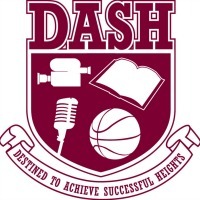 Destined to Achieve Successful Heights (DASH) provides opportunities for students to learn about various aspects of the entertainment industry while also learning how to become innovative thinkers and leaders. The Business of Entertainment curriculum includes learning modules that combine academics and real world experiences in three major areas of the entertainment industry: the business of music; the business of mass media; and the business of sports. DASH particularly focuses on entrepreneurship and technology throughout its curriculum. By bridging learning and the world of work in a way that leads to higher levels of achievement, the DASH program will be successful in engaging many students who would otherwise be indifferent to or possibly lost from school. DASH creates personalized learning for students, make learning relevant by using careers as a context for learning, and help adolescents learn about future career opportunities and connect in meaningful ways with adults who want to see them succeed.